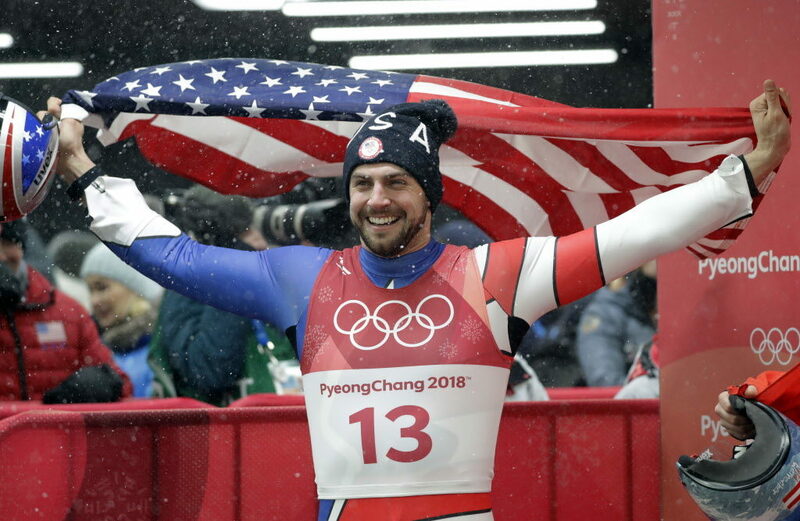 The other day, Chris Mazdzer did something no American has ever done: medal in the Olympic luge. You know the luge, it’s the one where the seemingly rubber-suited guys lie on their back on a sled and hurtle down the bobsled track at 80 miles an hour, sneaking an occasional peak to see where in God’s name they’re going and on which upcoming turn they might die. It’s a sport dominated by Eastern Europeans, because we Americans have apparently decided we have better things to do, like explaining, during literally every single routine, the excruciatingly simple colored dots scoring system used for figure skating. Note to Johnny Weir: we get it. Seriously. As an Olympic-level Olympics addict, I am accustomed to the studio host throwing it down to Lewis Johnson, who’s standing there with the athlete who either 1) just accomplished the thing they’ve spent decades working toward and who is now being given sixty seconds to put “how they feel” into words, or 2) just made a tiny mistake nullifying the accomplishment that they’ve spent decades working toward and who is now being given sixty seconds to put “how they feel” into words. Invariably, win or lose, the athlete will pull out some worn platitude about effort or desire or about never letting anyone (or anything, including the only moments-old failure) stand in the way of your dreams. "Honestly? It's all in the mentality. I was so comfortable with who I am. I had to go through those ruts to be comfortable with who I am without results. Basically, as a human, I'm comfortable where I'm at, I know what I can do, I know what I can give to the world...I was just so relaxed, just knowing that. I was really at peace with myself. So no matter what happened, I have an amazing group of friends and family that are there to support me, and I think they give me tons of energy for this." Martin Luther, the great Reformer, talked about a difference (and necessary distinction) between "active" and "passive" righteousness, and that’s just what Mazdzer is getting at here, most likely without knowing it. Luther said that it was only when a person could accept that all the goodness, love, and acceptance (in other words, righteousness) that one could possibly need was received passively (i.e. without doing anything to earn or previously merit it) from God via his one-way action could that person then turn around and love their neighbor (“active righteousness”) without needing anything from him or her in return. So, contrary to the world’s way of thinking, which teaches that the quality of love you show your neighbor determines the quality of love you receive from God, Christianity teaches the exact opposite: that a righteousness with which you act must necessarily come from a righteousness you have first received. This, by the way, is Good News: you are righteous because God, on account of Christ, has decided to call you so, not because you have earned the moniker by the sweat of your spiritual brow. Chris Mazdzer gets it. If he had to slide fast to earn the love and acceptance of his family, he’s done for. He might as well have—and probably would have—crashed into the first turn. How sweet it is for him, then, to know that the love and acceptance of his family is something he already possesses! He is comfortable with who he is, with his righteousness, without results. His righteousness is completely passive. He is free to go all out, court failure, and actually win (or at least come as close to winning as an American luger could possibly get)! If you had to worry (as perhaps you have, or even do) that your belovedness was contingent on your service, you’d be done for. The best case scenario there is tireless effort, leading inevitably to either self-righteousness or despair. Enough is never enough. The worst case scenario is walking off the field (or descending from the luge start house) without even trying. Why try to please such a demanding God? The good news for Christians is that our demanding God is pleased already, but not by us: "This is my beloved Son, with whom I am well pleased" (Matthew 3:17). When we lie back on the luge and look down the track of the Christian life (too far? I’ve stretched the metaphor too far, haven’t I? Oh well, might as well plow ahead...), we can push off knowing that we can crash into every turn all the way down and not sacrifice one iota of love, acceptance, and favor that is ours, from God, on account of Christ. We didn’t do anything to earn it—we received it passively—and so don’t need to worry about losing it. As Chris Mazdzer slid perfectly, knowing that he was beloved even if he finished last, we can crash and burn, cross the finish line last, look up, and see our name atop the leaderboard. In Christ, victory is yours, before you even begin. So feel free to go sledding.